After completing both the personal and professional assessment of your building’s current level of safety, you may have already discovered ways to improve the safety of your facility on your own. This section of the Building Owner’s Toolkit is meant to give you specific information about various technologies you can install to improve the safety of your building. It will also outline several key safety standards and best practices that you should adhere to. The information in this section has been developed by collaboration of technical experts to expose you to a broad spectrum of building safety technologies. In any emergency situation, communication of critical information to all of your building occupants is pivotal to ensuring each person’s safety. With the appropriate communication and notification technologies, your building’s occupants will be able to make informed decisions in the event of an emergency. Automatic communication systems can play digitized emergency audio messages to building occupants through room loudspeakers and telephone sets, can lock out intruders, and can monitor building activities through a networked system of cameras, microphones, and sensors. These safety and emergency communication systems are standard practice in modern schools and hospitals and should be installed as a key feature of all high-performance buildings. Initiating a clear, calm, and concise message to warn occupants of pending calamities or dangers. Pre-recorded messages can be triggered by fire, intrusion, weather, loss of power, or other emergency events. Notifying different building areas and occupants of equipment or environmental problems including flooding, HVAC failures, refrigeration failures, and air quality issues. Locking down the building to protect occupants from dangers (e.g., active shooters). Providing visual indicators for hearing-impaired occupants. Sensing ambient noise to automatically adjust emergency loudspeaker volumes to compensate for excess noise in lunch rooms or conference rooms. 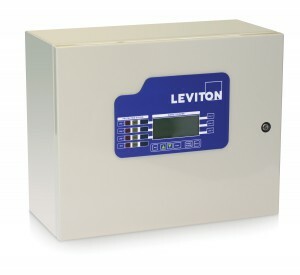 Monitoring system functionality to detect line, amplifier, or system failures. This feature is especially important if the emergency communication system sits idle for long periods. Increasing reliability through use of uninterruptable power supplies, fire resistant conduit, and distributed controls to ensure continued operation in the midst of fires and power failures. It is recommended to have at least two methods of conveying detailed messages to all occupants and three or more ways to alert building occupants of danger or disaster. With additional communication abilities, all of your building occupants will be able to make informed and logical decisions in the event of an emergency. In the case of extreme building damage (such as the partial collapse of the building), the communication tools may become damaged or inoperable. Therefore it is necessary to implement a crisis communication plan. This plan should be specific to your building and its occupants and include necessary protocols to follow for all possible emergency scenarios and two or more secondary methods of communication. Secondary methods of communication during an emergency include: text/email alerts or traditional radio communication. However text and email are passive methods and are considered unreliable for primary safety communications. In order to keep building occupants safe from potential hazards, proper labels and warnings are needed to alert and communicate potential dangers to your building occupants in a concise and straightforward manner. Standards for hazard communication are divided into three main categories that are relevant to building owners: Environmental/Facility Safety, Product Safety, and Barricade Tags for Temporary Hazards. These three categories are parts of the ANSI Z535 series of standards outlining a methodology for communications. They cover specifications for safety colors, symbols, and texts that are necessary to use when communicating the dangers of hazardous areas or products. Warning: Indicates a hazardous situation which, if not avoided, could result in death or serious injury. Caution: Indicates a hazardous situation which, if not avoided could result in minor or moderate injury. Notice: Is used to address practices not related to physical injury. Safety Instructions or Signs: Indicate specific safety-related instructions or procedures. It is worth noting that insurance companies use the Z535 standards (particularly Z535.2, Z535.4, and Z535.5) to evaluate and calculate the cost of insuring your building. Also, these standards have been presented in courts as best practices and have been used as evidence and exhibit materials in liability cases. Multiple local, state and national building codes, such as the National Fire Protection Association’s (NFPA) Life Safety Code (NFPA 101) and National Electrical Code (NFPA 70), require the installation and inspection of emergency lighting and exit signs before an occupancy permit is issued. Emergency lighting equipment and exit signs are part of every life safety equipment program and must provide reliable and sufficient illumination to allow building occupants to exit safely in the event of a power outage, fire, or other emergency. Such emergency conditions range from simple power outages to more catastrophic occurrences like fires and earthquakes. It is important to note that various types of facilities require different types of emergency lighting equipment and exit signs. Some building types have special needs. Hotels and motels, for example, have guests who are likely unfamiliar with their surroundings and could easily become disoriented during a fire or other emergency. Therefore, it is critical to examine a facility carefully to determine the emergency lighting equipment and exit signs best suited for the building and its occupants. Liability is increasingly a major concern for building owners. With concerns over rising costs, insurance authorities in many parts of the country have tightened their inspections of life safety equipment, including emergency lighting, on insured proper¬ties. This places greater responsibility on building owners to conform to applicable codes and standards. Building owners must also ensure their emergency lighting systems are tested in accordance with National Electric Code® (NEC) requirements. The NEC also requires written records of the test results. Photo Credit: Dual-Lite – Division of Hubbell Lighting, Inc.
Exit signs are generally internally illuminated markers that are located above or adjacent to a doorway or other exit discharge location to facilitate safe passageway out of a public facility or structure. The letters spell out the word “EXIT” and are typically 6″ high, 2″ wide (except the letter “I”) and have a stroke width of 3/4″ with 3/8″ spacing. However, exit signs with reduced legends are permitted provided they are tested to be visible and legible at a viewing distance of 100′. Exit signs must also contain provisions for directional indicators when used to direct occupants to an exit dis¬charge that is not easily identified or in a direct line of sight. Technologies such as incandescent lamps, compact fluorescent lamps, and cold cathode lamps have been used for internal illumination of exit signs but have largely been replaced by LED technology in order to meet energy compliance codes. Tritium-activated phosphor is also found but its use can be restricted and should be confirmed by local authorities prior to installation. 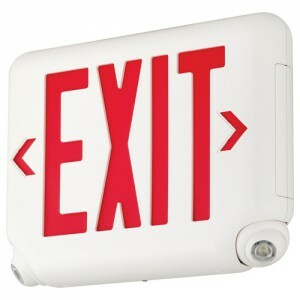 Two types of exit signs are available: AC-powered exit signs and battery-powered exit signs. Exit signs may be energized by the AC service without an internal battery backup if used in conjunction with a generator or central inverter system or by a remote battery source. This will ensure that the signs will continue to operate after the loss of AC utility power. Battery-powered signs must be equipped with a pilot light/test switch mechanism that allows for field testing of the battery backup system to ensure proper operation of the exit sign in case of the loss of AC power. Exit signs must be in all buildings, rooms or spaces required to have more than one egress or exit access. Exit signs should be located along the required means of egress and be visible from that access and at all exit doors or exit access areas. Directional exit signs should be located at changes of direction in the egress path. Entrances to egress stairs should also be indicated with exit signs. The Life Safety Code® requires that the exit access, defined as designated stairs, aisles, corridors, ramps, escalators and passageways leading to an exit, shall be continuously illuminated during normal AC line power conditions and building conditions of occupancy. This path must be illuminated to 1 footcandle (fc) minimum at the floor. Additionally, the Life Safety Code® requires an emergency path of egress be initially illuminated during emergency conditions to an average of 1fc at the floor, and not less than 0.1fc at any given point along the illuminated path of egress. An emergency lighting unit is a battery-operated light source that becomes operable upon the total or partial loss of AC or normal utility power. This self-contained lighting equipment can be supplied with a variety of battery and lamp types depending on the application and lighting requirements. The loca-tion of the batteries and the ambient temperature of the area will generally determine which battery source is chosen. Spacing for either complete units and/or remote heads varies depending on lamp type, lamp technology, and beam spread. The location of emergency lighting units should be spaced to meet or exceed minimum code requirements. Battery packs can be used as self-contained emergency lighting equipment when mounted inside or on the outside of linear or compact fluorescent light fixtures or LED light fixtures. 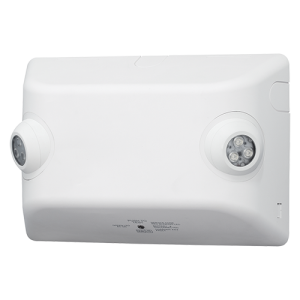 In the event of a total or partial loss of AC or utility power, these self-contained emergency packs will operate one or two of the existing fixture’s lamps, generally at reduced lumen output. Battery packs can be used to back up most any type of compact or linear fluorescent fixture. Battery packs for fixtures utilizing metal halide lamps are also available. These metal halide battery packs typically only maintain the arc of the lamp for about two minutes, which is enough time for a generator or interruptible central inverter system to synchronize the lighting load. Central Inverter Systems are battery-operated emergency backup equipment generally used to support existing ambient lighting by replicating the AC utility voltage in the emergency mode of operation. Central Inverter Systems house all batteries and control equipment in a central location and provide back-up power to many remote devices, as compared to individual emergency units and fluorescent/LED battery packs that each house their own batteries and controls. Interruptible Power Systems (IPS) have a transfer time of 50 milliseconds or more. At the loss of AC power, these systems will operate any type of lighting load except HID at full light output for the required 90 minutes. With HID source lighting such as Metal Halide lamps or High Pressure Sodium lamps, Uninterruptible Power Supply Systems (UPS) make the transition to battery power automatically with no loss of power to the lighting fixtures. Because a UPS system is an uninterruptible system it is compatible with all types of lighting loads including HID lighting. Dual-Lite – Division of Hubbell Lighting, Inc.
Having the proper fire safety systems is crucial to providing safety to your facility and its occupants. The first line of defense in a fire is an active alert or alarm system. It is important as a building owner to understand the difference between a smoke alarm and smoke detector. A smoke alarm is single unit that is disconnected from an overall system. It has an alarm and detector all in one. A smoke detector is connected to an overall fire alarm system is usually works in conjunction with other detectors throughout your building. It is recommended to have a complete fire alarm system within your building for optimal safety. Smoke detectors offer the earliest warning of fire possible. They have saved thousands of lives in the past and will save more in the future. For this reason, detectors should be located on every level of a building. Ionization detectors are better at detecting fast and flaming fires than slow, and smoldering fires. Photoelectric smoke detectors sense smoldering fires better than flaming fires. To provide effective early warning of a developing fire, fire (smoke) detectors should be installed in all areas of the protected premises. Total (complete) coverage, as described by NFPA 72, should include all rooms, halls, storage areas, basements, attics, lofts, and spaces above suspended ceilings, including plenum areas utilized as part of the HVAC system. In addition, this should include all closets, elevator shafts, enclosed stairways, dumbwaiter shafts, chutes, and other subdivisions and accessible spaces. Fire detection systems installed to meet local codes or ordinances may not be adequate for early warning of fire. A user should weigh the costs against the benefits of installing a total (complete) fire detection system when any detection system is being installed. “Total Coverage,” as described in NFPA 72, is a complete fire detection system. In some of the specified areas of coverage, such as attics, closets, and under open loading docks or platforms, a heat detector may be more appropriate than a smoke detector. Placement of detectors near air conditioning or incoming air vents can cause excessive accumulation of dust and dirt on the detectors. This dirt can cause detectors to malfunction. Detectors should not be located closer than 3 feet from an air supply diffuser or return air opening. In damp or excessively humid areas, or next to bathrooms with showers. Tiny water droplets can accumulate inside the sensing chamber and make the detector overly sensitive. Do not place in or near areas where combustion particles are normally present, such as in kitchens or other areas with ovens and burners; in garages, where particles of combustion are present. Do not place in or near manufacturing areas, battery rooms, or other areas where substantial quantities of vapors, gases, or fumes may be present. The following information is intended to help prevent undesirable electrical arcing from potentially starting a building fire. Fire investigation studies indicate that electrical arcing between wires or between wires and grounded metal surfaces cause 20-40% of all electrically ignited fires. Electrical arcing can occur through loose wire connections, by physical damage to extension cord insulation, wire insulation damaged by long term exposure to moderate or high heat, electrical surges, or even from a misplaced drywall screw or picture hanger nail. Arc Fault Circuit Interrupter (AFCI) protection can detect and interrupt arcing to help prevent fire ignition. The National Electrical Code® requires AFCI protection in new construction, but existing buildings are more prone to faults due to wear and tear on electrical systems. AFCI protection can be installed at the breaker panel or in the first receptacle of each branch circuit. To get the best arc fault protection from AFCI circuit breakers, install combination-type AFCI circuit breakers, not branch/feeder-type AFCI circuit breakers. AFCI devices should be regularly tested for proper operation using the test and reset buttons clearly marked on the devices. AFCI receptacles should be installed within reach so you can easily test and reset the devices on a regular basis to ensure they are functioning properly. To identify if your circuit breakers or outlets contain AFCI protection, look for the “AFCI” identification mark on the circuit breaker or outlet face. If you do not have AFCI protection in your building, install it as soon as possible for added fire protection. Many new buildings will have these advanced arc fault circuit interrupters in place, but even new buildings can increase their level of protection. Updating the circuits from standard devices to those that are designed to detect arcing and sparking that may cause electrical fires provides that additional level of protection against arcing faults. Use a qualified electrician to ensure a proper, safe installation. In photovoltaic (PV) solar electricity generation systems, loose connections have caused a number of building fires. Safe PV systems should be protected with AFCI in the inverter to open the output circuit if arcing occurs. Hire a qualified electrical contractor who is trained on the equipment and on electrical safety to help you perform a safety check in your building. When plugging and unplugging appliances, inspect the cords. Look for any signs of damage due to wear and tear including cracked, cut or crushed insulation, discoloration or melting due to heat. 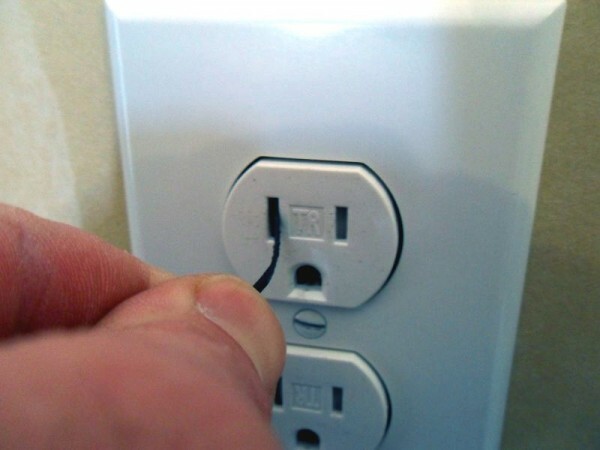 Sometimes plugs can be crushed between furniture and the wall, weakening the conductor insulation. Cords can also be damaged through abuse by improperly removing them from the receptacle outlet, being stepped on, or placed under the leg of chairs or other types of furniture. Extension cords should never by placed underneath carpets or area rugs or tucked under baseboard molding. Extension cords are not designed as permanent wiring for appliances or equipment. Compare the sum of all electrical rating(s) of appliance loads with the extension cord capacity. If the load exceeds the cord capacity, then reduce the load for that cord. Inspect cords for visible damage such as strain at plug connections, cuts or crushed insulation, and discoloration or melting caused by high temperature exposure. Dispose of any cords with these dangerous signs. Regularly inspect appliance cords, connections and parts for signs of damage. Heat damage can appear as pitted or corroded electrical contacts, discolored wire insulation or plastic, and melted or deformed plastic. Ensure you are using appliances in the manner intended by the manufacturer. Consult the manufacturer if needed. Repair or replace questionable appliances. Arc-fault circuit interrupters (AFCIs) come in both outlet and circuit breaker forms and operate by using advanced technology to detect dangerous arcing conditions while allowing normal arcing such as is caused by a light switch or electric motor. 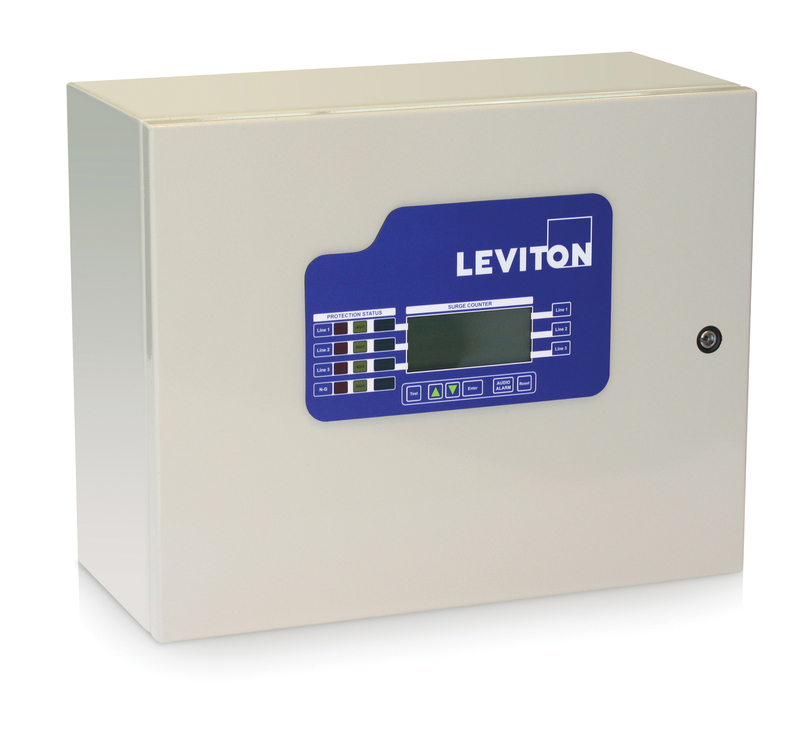 These devices provide an increased level of protection from electrical fires for your building. An AFCI can detect an arc-fault, which creates high-intensity heat that could ignite a building’s inner structural walls or insulation. Arc-faults can occur from damaged, overheated, or stressed electrical wiring, worn/old electrical insulation, and damaged appliances. When an arc-fault is detected, the AFCI can immediately shut-off the power to that circuit before an electrical fire has a chance to start. While AFCIs are not typically required for commercial buildings, many architects, engineers, and building owners recognize the added safety that they provide. AFCIs can be found at electrical distributors, hardware stores, and home centers. Even though AFCIs cost a little more than traditional outlets and circuit breakers, they provide an extra level of protection to your building and business. Make sure to test your AFCI devices once a month. Available in both single- and multiple-gang version, in both steel and nonmetallic fabrications, fire-rated floor boxes preserve the two-hour fire rating of floors in which they have been installed. When properly installed, Fire Classified Floor Boxes can save time and money for general contractors and installers by eliminating the need for spraying to fireproof floors. Be sure to only install floor boxes that meet or exceed the UL Fire Classification Standard for Floor Boxes (look for the UL or Warnock Hersey mark on the product). In order to protect the integrity of a firewall, without adding caulk or putty after cables are installed, you can use a fire-rated, thru-wall fitting. They meet UL tests for flame, temperature, and smoke, as well as for use in air handling spaces (plenums) and are made with fire-stopping intumescent material with an enclosed thru-wall penetration. Once installed, these fittings let you add or remove cables easily, without risking the unseen and potentially dangerous gaps or voids that can occur with caulks or putty. If the temperature reaches approximately 375°F, the material expands, creating a hard char that fills voids around the cables and stops flame from penetrating the opening. This prevents further damage to the cabling and your networks. Be sure to only install devices that meet or exceed UL standards (look for the UL or Warnock Hersey mark on the product). 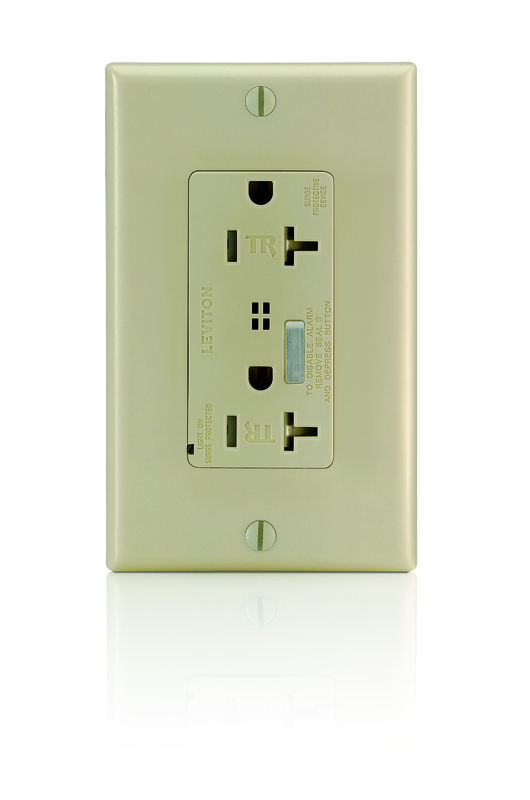 The National Electrical Code® (NEC) has requirements for receptacle outlets in various locations in a structure. Many of those outlets are in locations that are subject to a wet or damp environment. The NEC requires outlets installed in these locations to be protected by a Ground Fault Protection Interrupter, commonly called a GFCI. A ground fault is an unintentional electrical path between a power source and a grounded surface. That path could be an individual’s body, which could then be burned, shocked, or electrocuted. Ground faults often occur when equipment is damaged or defective. A GFCI will interrupt the power within as little as 1/40 of a second to the circuit if it detects a fault or leakage current flowing along an unintended path. Once the GFCI trips it must be manually reset by the user. GFCI devices are available as either a circuit breaker, which would be located in the supplying panel, or as a receptacle outlet device, which can also protect all devices located downstream from it. GFCIs are also available in portable and cord-connected types for construction sites and special applications where installed GFCIs are not practical. A GFCI is primarily a personal protection device, and is designed to protect people from severe or fatal electric shocks. 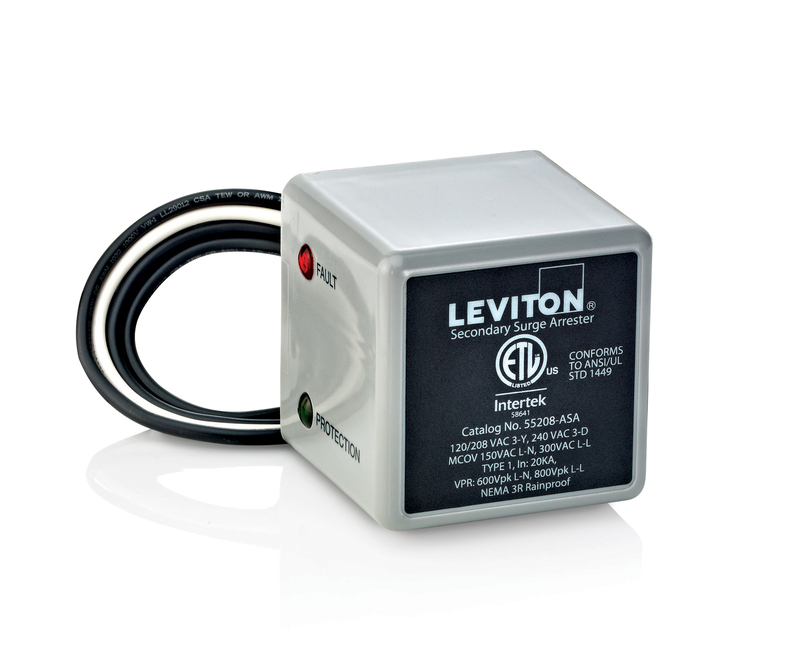 Because a GFCI detects ground faults, it can also provide some protection against fires. GFCI devices should be tested at least once a month. 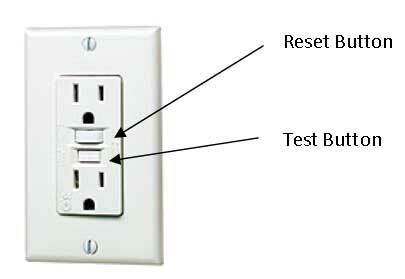 In 2015, UL will require all new GFCIs to include a self-test feature. The 2008 National Electrical Code® (NEC) required new and renovated dwellings to have tamper-resistant (TR) receptacles. These receptacles have spring-loaded shutters that close off the contact openings, or slots, of the receptacles. When a plug is inserted into the receptacle, both springs are compressed and the shutters then open, allowing for the metal prongs to make contact to create an electrical circuit. Because both springs must be compressed at the same time, the shutters do not open when a child attempts to insert an object into only one contact opening, and there is no contact with electricity. Tamper- resistant receptacles are an important next step to making the home a safer place for children. Each year, approximately 2,400 children suffer severe shock and burns when they stick items into the slots of electrical receptacles. It is estimated that there are six to 12 child fatalities a year related to this. 24,000+ children under 10 years old in the U.S. were treated in emergency rooms for incidents related to electrical receptacle-about seven children per day for the 10 year period from 1991-2001 according the U.S. Consumer Product Safety Commission. TR receptacles have been mandated in hospital pediatric wards for over 20 years and have proven to effectively prevent electrical injuries. Why use tamper-resistant electrical receptacles? Each year, approximately 2,400 children suffer severe shock and burns when they stick items into the slots of electrical receptacles. It is estimated that there are six to 12 child fatalities a year related to this. 24,000+ children under 10 years old in the U.S. were treated in emergency rooms for incidents related to electrical receptacle-about 7 children per day for the 10 year period from 1991-2001 according the CPSC. 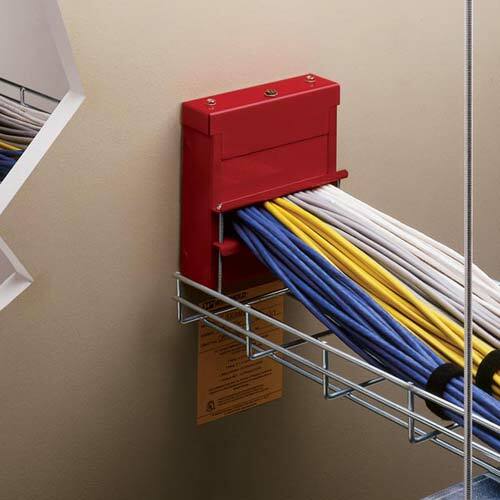 The current edition of the National Electric Code® (2014) now requires TR receptacles in all dwelling units, guest rooms and guest suites of hotels and motels, childcare facilities, and pediatric care locations. Surge protective devices (SPDs) are designed to reduce the random energy surges of voltage transients and electrical noise on the power supply line or communication lines. Surge protection is an important way to protect sensitive electronic equipment as well as other electrical apparatus. Surges can occur due to many causes including lightning, short circuits, large loads turning on or off and equipment failure. Surge protective devices help to prevent excess power from causing damage by absorbing and or directing the electrical power to ground. For a building SPDs are typically classified by types 1, 2, and 3 with type 1 being the first line of defense against external surges and typically installed before the main service disconnect at the utility meter. Type 2 SPDs are typically installed at the main distribution panel, a branch circuit panel or at a piece of equipment. 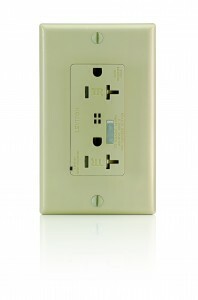 Type 3 SPDs are usually in the form of multi-outlet strips or receptacles. For optimum protection, it is recommended to implement a “surge protection network” which would utilize all three types. SPDs should be listed to Underwriters Laboratories’ UL1449 (3rd Edition) standard. The following information has been excerpted from NEMA’s Application Guide for Carbon Monoxide Alarms and Detectors for you to use as an informative tool to install the proper systems in your building. CO is an odorless, tasteless, highly toxic gas that results from the incomplete combustion of fossil fuels. Why is CO a Concern? CO is often referred to as “the silent killer” because it is virtually impossible to detect without an electronic sensing technology. This is particularly of concern to those who are not aware of the poisoning process due to sleep or other conditions that render them oblivious to, or incapable of escaping, the process. During 2001-2003, an estimated 15,200 people with confirmed or possible non-fire-related CO exposure were treated annually in hospital emergency departments. In addition, during 2001-2002, an average of 480 persons died annually from non–fire-related CO poisoning. The majority (64.3%) of non-fatal CO exposures were reported to occur in homes. CO is formed from the incomplete combustion of fossil fuels. Many common appliances, machinery, and heating equipment, if not working or vented properly, can produce dangerous CO build-up in a given environment. 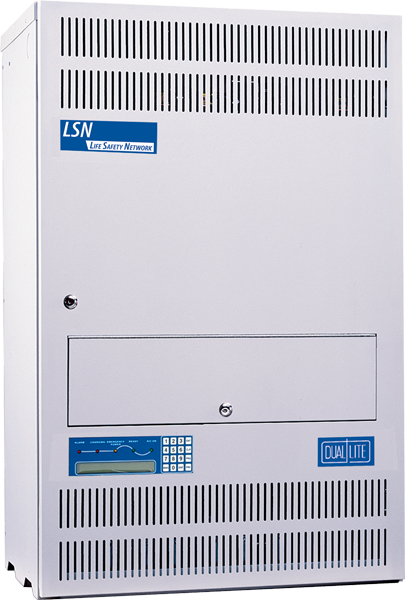 A single station CO alarm is a detector composed of an assembly that incorporates a sensor, control components, and an alarm notification appliance in one unit operated from a power source either located in the unit or obtained at the point of installation.A multiple station CO alarm is a single station CO alarm capable of being interconnected to one or more additional alarms so that the actuation of one causes the appropriate alarm signal to operate in all interconnected alarms. Below is a table showing different types of CO-Detector products that are available for purchase and Installation. CO detectors may be connected to a dedicated CO-detection system or a combination system. Typically, they are connected to a fire alarm control unit. The CO detectors obtain their operating power from the control unit, which activates the notification appliances when CO is detected. When installing a CO detector or a CO alarm, do not install it in any environment that does not comply with the manufacturer’s environmental specifications. All CO-detection devices should be installed in accordance with the manufacturer’s published instructions and in accordance with NFPA 720, which outlines the requirements for commercial installations of CO-detection equipment. When installing a combination alarm or detector, also follow the installation requirements in NFPA 72 and the manufacturer’s published instructions. CO alarms or detectors should be mounted on the wall, ceiling or other locations as specified in the manufacturer’s published installation instructions. When wall mounting a CO alarm or CO detector, it should be at least as high as a light switch and at least six inches from the ceiling. (CO gas typically rises from the point of production and then mixes evenly throughout the air as it cools.) Furthermore, higher placement protects the CO-detection device from potential damage by pets and tampering by small children. 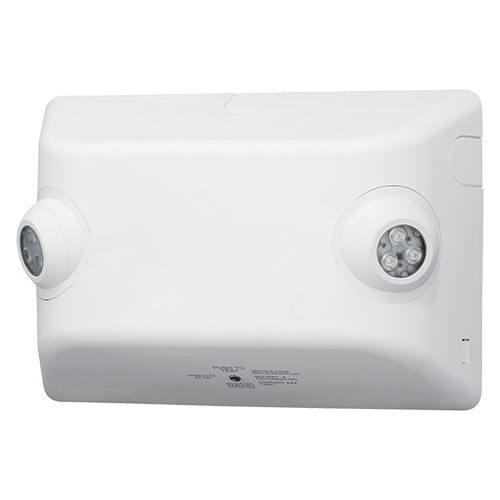 When ceiling mounting a system-connected CO detector, the detector should be located at least 12 inches from any wall. To read a more specific guide with technical guidance on proper practices for carbon monoxide alarm systems, you may download the full document here.